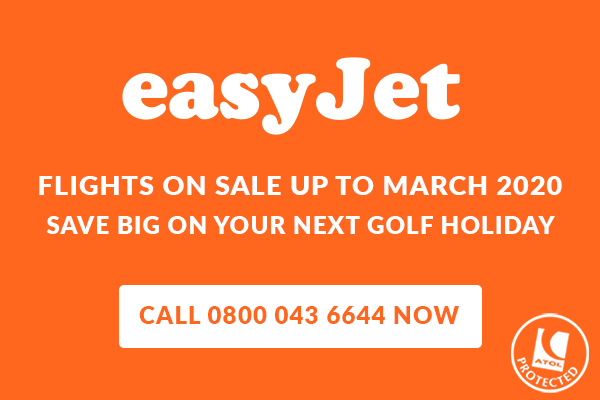 Book Golf Holidays including flights to Spain, Portugal, USA, Turkey & more! As ATOL and IATA licence holders, Your Golf Travel are pleased to offer golf holidays including flights to many of the great destinations throughout Europe and the Rest of the World. Whether it is a short weekend golf trip to the Algarve or a luxury golf inclusive package to Mauritius, we're sure to find the perfect fairway for you. With a host of flights and airlines to choose from, all you'll need to do is, let us know your preferred date of travel and departure airport and we'll do the rest. With our specialist flight department, we are able to secure flights at the best available contracted rates, so that your entire golfing holiday can be booked with confidence. We have negotiated airfares with all the major airlines for both short and long haul, such as British Airways, Thomas Cook Airlines, Virgin Atlantic and Etihad Airways to make sure that just a standard deposit is required. With flight prices changing on a frequent basis, the below are listed as a guide, however we'll be pleased to provide you with a tailored quote to any of our 3,500 destinations across the world. Where would you like to go on your Flight inclusive golf holiday? To add flight options to your holiday, speak to our dedicated Holiday Specialists now. Flight options to Spain from UK airports are numerous and it is easy to find a fantastic value flight for your golf holiday. Popular destinations for golfers include Murcia, Malaga and Alicante, those travelling to the likes of La Manga or Mar Menor have options of flying into Murcia which is a much shorter transfer into resort while Alicante airport is a simple drive of around an hour. Flights to Portugal out of Heathrow and Gatwick into Faro are scheduled daily with Vilamoura, Vale do Lobo and Quinta do Lago the most popular destinations for golfers. You can be on the golf course within 20 minutes of leaving the terminal, while other golfing spots such as Penina and the West Algarve can be reached in less than an hour. For this reason many people opt to travel early morning from their departure airport which will in turn allow a round of golf to be played in the afternoon on the day of arrival. Those wanting to experience the great golf on Lisbon's coast will enjoy regular flights out of Heathrow and Gatwick which open up a wide variety of different courses, from the links layouts at Praia D'El Rey to the popular tree-lined designs at Aroeira. With short flights times and departures from many regional UK Airports its hard not to say Yes to a Golf holiday to France. With award winning Hotels and Golf courses, exceptional gastronomy and of course brilliants wines, from the glamour of the Cote d'azur to the ruggedness of the West Coast France France is a must for golfers of all abilities. Flights to Italy's regional airports are easier than ever to book and its hard not to fall in love with a golf holiday to this romantic destination. Superb Hotels and beautiful Golf courses from Sicily to the Italian Lakes and Rome, Ryder Cup host city in 2022, await you in the country renowned for its passion. Direct flights to Turkey are offered from most UK major cities including London, Manchester, Birmingham & Glasgow. When we head to Turkey, Antalya International Airport is only a 30-minute drive from the centre of Belek, where you will find many stunning golf courses along with 5* luxury Resorts. We are pleased to announce a direct flight from London Gatwick to Antalya with Turkish Airlines. All bookings include FREE golf bag carriage & Hold luggage, meal & drink. 2018 Skytrax award for "Best Airline in Southern Europe"
Turkish Airlines baggage policy applies. In recent years the improved flight routes into Marrakech, Agadir, Essaouira and Casablanca has opened up some fantastic golf resorts to exploring golfers. With year-round sunshine and a host of championship designs by the likes of Jack Nicklaus and Gary Player, it is easy to see why this North African destination has become a place people return to year after year. Promotion available on Air Arabia Maroc operated flights only. Air Arabia Maroc baggage policy applies. When searching for the ultimate European golf break it can be hard to look past Spain and Portugal, but when you do, you can find some of the most incredible golf destinations in the world. Stretched far and wide across the lesser-known golfing countries of Europe are some spectacular hidden gems that deserve a place on every golfer's bucket list. From the breathtaking ocean views of Aphrodite Hills on the coast of Cyprus to the epic Swiss Alps of Switzerland’s Golf de Crans-Montana, Home of the Omega Open, or the untouched beaches at Costa Navarino, there are golf courses to be discovered that are truly special. The USA is arguably the best place for a long haul golf trip. With the likes of Scottsdale, Florida and California boasting courses ranking amongst the Top 100 golf course rankings across the globe, its easy to see why golfers head to America. For those wanting to follow in the footsteps of the PGA Tour, we have a host of fantastic packages to PLAYERS Championship host Sawgrass, AT&T Pro-Am host Pebble Beach as well as a chance to recreate one of the most lively tournament experiences at TPC Scottsdale playing the famous par-3 16th hole. Mauritius’ selection of championship golf courses is seriously impressive and boast some of the most unique and dramatic layouts in world golf. From the superb Links and Legend Courses at Constance Belle Mare Plage to the immaculate Ernie Els design at Anahita Golf & Spa Resort, golfers will be in awe of the spectacular standard of golf courses. The island is also home to some of the most beautiful beaches in the world where the white sand meets the idyllic Indian Ocean and are surrounded by spectacular five-star hotels, offering luxurious and exotic accommodation. We are extremely proud to announce a new partnership with Air Mauritius! Book your dream golf holiday now and receive FREE golf bag allowance. Promotion available on Air Mauritius operated flights only. Applies to all direct flights from Heathrow to Mauritius only. Air Mauritius baggage policy applies. South Africa boasts a number of fantastic golf courses each in their own unique settings; you're likely to see wildlife off the rough, greens bordering the coast and of course a strong ocean breeze. Many of the premium courses in South Africa rank amongst the best in the world, all with championship pedigree; Fancourt Links (host of Presidents Cup), Durban Country Club (South African Open), Leopard Creek (European Tour), Gary Player at Sun City (Nedbank Golf Challenge) all examples of this. Even in the cities, you find some outstanding courses like the exclusive River Club in Johannesburg or the charming Clovelly near Cape Town; wherever you go in this diverse country, there will be a fantastic golf course for you to play. We are pleased to announce exclusive fares for a limited period with Turkish Airlines. All bookings include FREE golf bag allowance. Promotion available on Turkish Airlines operated flights only. The emirate has played a central role in growing the game of golf in the UAE. Since 2006, the game's best players have graced the National Course at Abu Dhabi Golf Club whilst playing the Abu Dhabi HSBC Golf Championship. The course has become a symbol of golf in the Middle East, thanks to its stunning layout and iconic clubhouse. The waterfront courses of Saadiyat Beach and Yas Links, provide equally memorable experiences, and an escape from the hustle and bustle of downtown Abu Dhabi. Off the course, golfers can expect a wealth of incredible activities ranging from the stunning Yas Marina Circuit which has been the finale of the F1 season since 2009, to the breathtaking Sheikh Zayed Mosque. So when visiting Abu Dhabi, you're sure of a world-class golfing trip, in it's unique and diverse surroundings. We are extremely proud to announce a new partnership with Etihad Airways! For a limited period only all bookings include Free Golf bag allowance up to 15kg and Included Luggage allowance up to 23kg on all flights with Etihad. Dreaming of some white sand beaches while enjoying a golf holiday? Well, look no further, we have some incredible options playing and staying at incredible golf resorts with access to some of the most picturesque golf courses in the world. Fancy playing golf down towards the Caribbean? Head to Royal Westmoreland in Barbados...or maybe some guaranteed sunshine playing some hidden gem Championship courses? Grab your clubs and go to Dubai to play the impressive Emirates, Address Montgomerie or Jumeirah Golf Estates courses. The rising star of Mediterranean Golf, Tunisia offers an alternative to other well known European destinations at superb value for money. With some great hidden gems and a great year round climate Tunisia is a gem of a destination just waiting to be discovered.